Our campus food pantry was created for students, by students. The pantry provides food assistance and other resources that enhance the community’s overall wellbeing. 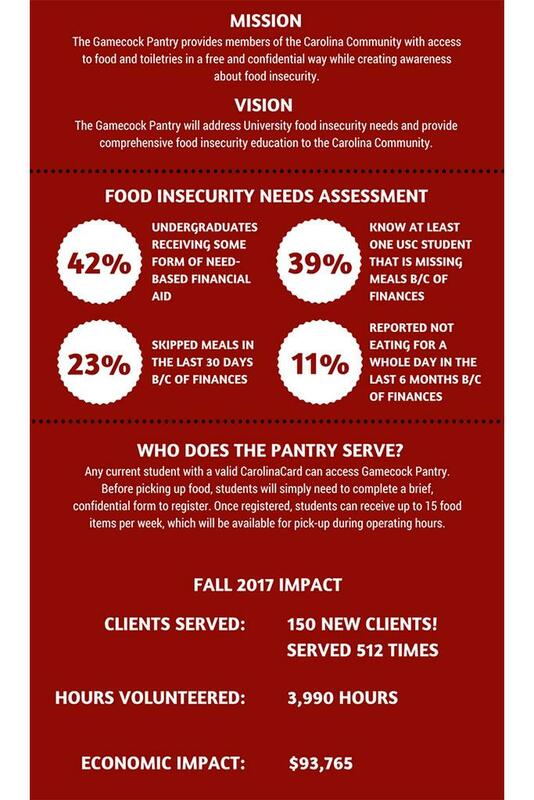 The Gamecock Pantry provides access to food and toiletries in a free and confidential way to members of the Carolina community while creating awareness about food insecurity at Carolina. The Gamecock Pantry will address University food insecurity needs and provide comprehensive food insecurity education to the Carolina Community. Who does the pantry serve? 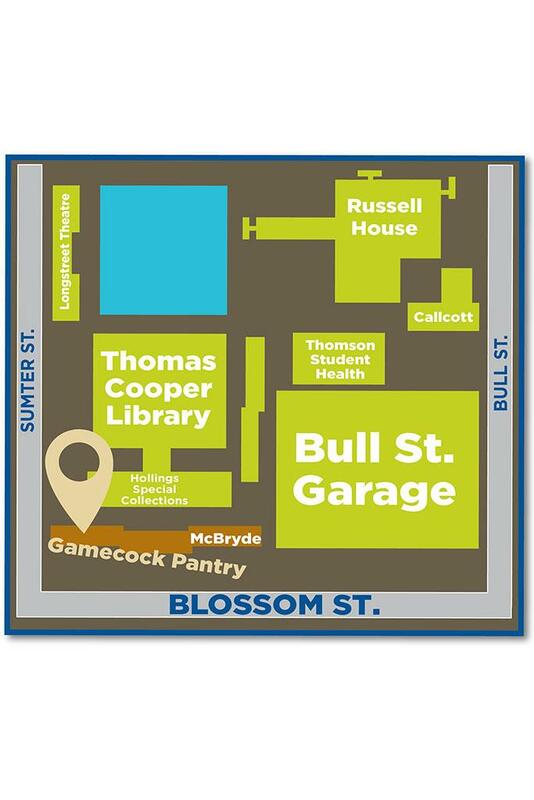 Any current student, faculty, or staff with a valid CarolinaCard can access Gamecock Pantry. Before picking up food, students will simply need to complete a brief, confidential form to register. Once registered, students can receive up to 15 food items per week, which will be available for pick-up during operating hours. Students may be eligible for additional aid if they have dependent family members in their care such as children. Proof of dependency will be required to receive additional aid. If you'd like to help with tasks ranging from preparing application materials to working a shift in the pantry, just complete the volunteer form. Select Specify Your Gift box. Next, expand the Student Life program line. Select Student Affairs and Academic Support. Select Other and type Gamecock Pantry in the Other Area field below the donation field. TO DONATE FOOD ITEMS. Before collecting cans, please email us at gamecockpantry@sc.edu for collection information. Gamecock Pantry was created by students, for students and is led by a volunteer team of student leaders. All members of the Gamecock Pantry Executive Board will be responsible for working collaboratively with members of the university community as well as fulfilling duties as needed for the overall success of the program. Each position has unique responsibilities and expectation that contribute to the overall success of the Gamecock Pantry. Weekly Service Leader Training- Fall 2019 (all semester), Tuesdays from 3-4 p.m. The Executive Director will oversee and manage the overall operation of the Gamecock Pantry by working collaboratively with LSC staff, monitoring other executive board members, and ensuring all objectives are reached in a timely manner. The Director of Outreach & Education will be in charge of advocating for the pantry and educating the community on both the pantry and food insecurity as a whole. The Director of Operations & Logistics will be responsible for managing and maintaining the daily functioning and systemization of the pantry. The Director of Communications, Marketing, and Media will run and maintain all of the social media and communications for the pantry. The Donations Coordinator will be responsible for creating and maintaining donation partnerships, asking for donations when in-need, and coordinating pick-up and drop off of donations. Direct all questions to Lacie Rhoden at rhodenll@mailbox.sc.edu or Madison Stephens at stephem@email.sc.edu. Get the latest news from the pantry. Share your feedback with other students. See what's new at the pantry. Follow Gamecock Pantry on Twitter. Discover the impact of Gamecock Pantry. 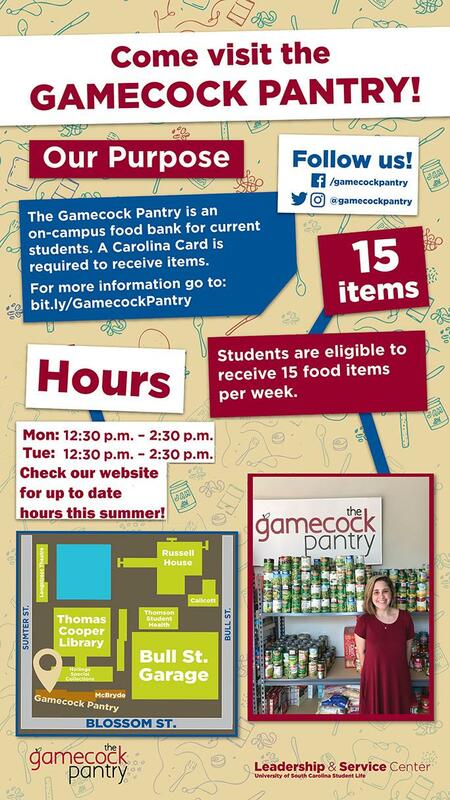 Learn how the Gamecock Pantry works and how you can help us stock the shelves for students in need.